This summer Klaas Kloosterboer, Chris Martin and Jim Shaw will transform the Submarine Wharf into a gigantic art studio. 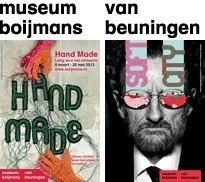 This is the fourth consecutive summer that Museum Boijmans Van Beuningen, in collaboration with Port of Rotterdam, is organising an exhibition of contemporary art in Rotterdam’s docklands. 'Submarine Wharf - XXXL Painting' is on view from 8 June until 29 September. In the months leading up to the opening, the artists will be busy at work in the wharf, creating the exhibition on site. Museum Boijmans Van Beuningen wishes to demonstrate the resilience and energy of the art of painting with a true ‘battle of the Titans’ between the three artists. If you want to get to know Chris Martin you can follow the points of reference that his paintings delineate in the space of our collective memory, like a child joining the dots of a dot-to-dot drawing: from one painting incorporating the name ‘Hilma af Klint’ (1862-1944) to the next inscribed ‘for Amy Winehouse’ (1983-2011), to a third ‘for Alfred Jensen’ (1903-1981), to works dedicated to James Brown (1933-2006), Paul Feely (1910-1966), Andrei Tarkovsky (1932-1986), Sun Ra (1914-1993) etc., until all the sources of inspiration are linked and the area enclosed by the lines suddenly reveals a recognisable figure [fig.]. Not Mickey Mouse with a wheelbarrow, but the contours of an artist with a strong historical awareness who is nonetheless firmly rooted in the present. An artist for whom music and visual art are tightly interwoven. An artist who does not feel at home in the pantheon of great American modernists but who prefers to pitch his tent in the margins in the company of a few European pioneers of abstract art, lesser gods (for now) and ‘outsiders’. Above all, you see someone with an interest in things that Dutch sobriety dismisses as vague or woolly: things related to the human spirit and its ability to transgress the bounds of reason. This is the contour you see, but no trace of the painter Chris Martin. Who is he? What does he make? And what does he want to achieve with his paintings? Martin was born in 1954 in Washington D.C. and grew up there in a house with bedroom ceilings more than four metres high. His grandmother was an artist, and modern art was a normal topic of conversation. His desire to become an artist was born aged fourteen when he was dragged to the museum and encountered a group of sculptures that caused an experience that could be termed ‘existential’. At least that is how he described it in a manifesto-like piece that appeared in 2003 in The Brooklyn Rail, a free arts newspaper: ‘the top of my head lifted off and a sudden sense of euphoria filled my chest’. Years later he discovered that the work that had brought about this epiphany was Sculpture Court by the American Colour Field painter and sculptor Paul Feely [fig.]. Following this revelation, he spent as much time as possible in his school’s art studio, where he attempted to replicate his overwhelming experience through an endless stream of drawings and gouaches. Again and again. He discovered the work of Picasso (1881-1973) and luxuriated in the sense of freedom unleashed by combining Picasso (copying The Dance from 1925), James Brown (listening to ‘Mashed Potato Popcorn’) and a bottle of soda pop (Coca-Cola, of course). After graduating high school in 1972, Martin studied at Yale University School of Art, but left after two and a half years without completing his degree, burned all his work and moved to New York. This is where his true education began. In a cheap apartment on Houston Street in the years that followed he wrestled with his ambition to breathe new life into abstract painting. On the largest canvases possible. When Martin arrived in New York, few artists were engaged with painting, but that began to change a few years later, sparked by developments in Europe in the second half of the 1970s. Germany saw the emergence of Neo-Expressionism with painters such as Baselitz (1938), Kiefer (1945), Lüpertz (1941), Immendorf (1945-2007), Dahn (1954), Dokoupil (1954) and from Italy the art world was conquered by the so-called Transavanguardia with Chia (1946), Cucchi (1949) and Clemente (1952). Meanwhile in New York graffiti grew from a form of visual communication between gangs into street art of unprecedented quality, whose best exponents, such as Jean-Michel Basquiat (1960-1988) and Rammellzee (1960-2010), abandoned the street for highly successful ‘serious’ art careers [fig.]. Of all the so-called ‘Neue Wilde’, Martin was especially impressed by the German ‘alchemist’ Sigmar Polke (1941-2010) and fellow countryman Julian Schnabel (1951). Both saw painting as an adventure and introduced other materials besides paint, thus giving an important impetus to the development of the discipline [fig.]. For Martin, the graffiti artists demonstrated that public spaces were not the preserve of monumental and leaden sculptures by Minimalists such as Richard Serra (1939) but could also be animated by light and dynamic paintings that did not require cranes or other equipment for their installation. They consist of nothing but paint and the artist’s inherent need to make a ‘piece’. A third important factor in Martin’s development was his first trip, in 1983, to India, where he became attracted to the Buddhist view of life, death and the link between the two. The return to painting at the beginning of the 1980s coincides with another development: the art world grew bigger and more commercial. In New York the centre of gravity gradually shifted from the clubs and artists’ initiatives of the East Village to Soho, where a forest of commercial galleries sprang up, attended by the clamour of art bookshops, boutiques, hip restaurants and macrobiotic delis. In short: Patti Smith’s (1946) punk was replaced by Jeff Koons’ (1955) vacuum cleaners on 5th Avenue and Keith Haring’s (1958-1990) Pop Shop on Lafayette Street. Along with the increase in galleries, there were more artists, more studios, more art, more collectors and more money. The art world was booming; some artists could barely keep up with demand for their works and prices went through the roof. But the expansion and success were shot through with grief: the rise of AIDS saw artists attending as many funerals as gallery openings. For Martin too the 1980s was a period of upheaval, both in his personal and professional life. He moved from Soho to Williamsburg in Brooklyn - at that time a unsavoury neighbourhood but with an abundance of large, cheap industrial spaces ideal for use as studios - and began a family, but at a certain point found himself a single parent of two daughters. An extraordinary encounter with a Joseph Beuys sculpture - before reading the title Schneefall he heard the gentle thud of snow falling from a tree - proved for Martin that making art is not a question of conjuring with form; art is channelled energy. Inspired by Beuys (1921-1986), he decided no longer to focus on the deadly serious production of paintings but instead to concentrate on the pleasure and healing power of the act of painting itself. In 1990 he began to work with HIV patients and graduated from the School of Visual Arts. Thereafter he specialised in art therapy and from 1992 to 2004 worked fulltime as a therapist as part of America’s first AIDS Help programme. The only time he could paint was at night. And during these nocturnal sessions he made large black canvases with one or more box-like rooms indicated by just a few white lines. Because of the low horizon, you experience the spatial perspective as if you were lying on the ground, and as such each box seems to be a room that contains you, simultaneously suggesting that you can escape via the ceiling to float freely in an endless sky, just like the stray star high up the canvas [fig.]. It was only after the year 2000 that colour reappeared in Martin’s work with the creation of similar ‘tunnels for the soul’ in the primary colours against a black or white background. ‘...colour reappeared’, I have written above, but without any mention of the paintings from before 1990. Were they colourful? Before his major retrospective Staring into the Sun at the Kunsthalle in Düsseldorf in 2011-12, little was known about Martin’s early work. In addition to works made after 2004, following Martin’s fulltime return to painting, this exhibition and the accompanying catalogue featured a large number of paintings that have their origins in the 1980s. They give an insight into Martin’s working method in this period: he would paint a canvas in a quick, concentrated session and then set it aside, returning to it later - sometimes years later - to complete it. Furthermore, they show that the seeds of the various themes and motifs that recur in slightly altered form throughout his oeuvre were already planted some thirty years ago. Martin’s ‘griffin’ [fig. ], for example, is a figure that appeared to him in a dream in 1980. In its simplest incarnation the griffin is a single fork with four descending prongs, but there are also more complex variations in which each prong is subject to further subdivision, as in the painting that hangs on the exterior of the Submarine Wharf. Sometimes the prongs have coloured circles that seem to move up and down, as in a video-game. At first glance these griffins appear to have little connection with the mythological creature - half lion, half eagle - which connected land and sky and was the guardian of the divine. But when you realise that Martin’s griffin is always placed below his ‘horizon’ - under the ground - and functions as a sort of root system or infrastructure, then you can begin to develop an idea of how his mythical creature connects or protects things. Two other recurring motifs in Martin’s work that have a connection with nature, landscape and growth are the mushroom and the tree. Martin has made no secret of his (earlier) interest in hallucinogens and just as there is an ur-griffin from 1980, so there is also an ur-mushroom from the same year entitled Psilocybin [fig.]. Mushrooms containing this substance are known as magic mushrooms or paddos and are prized (and feared) for how they alter people’s experiences of reality: perception of time is altered or disappears entirely and the senses are heightened to a degree that people see, hear, smell and taste things that would normally escape their notice. Objects, animals and people appear to emit what can be described as an ‘aura’, which can take on many different colours and which may feel soft or prickly. On a bad trip, you can experience the world as brutal or hostile, but conversely you can also feel an intense connection with everything, especially nature, and gain an insight into your place in the scheme of things. The mushrooms can provide an answer (albeit a temporary one) to life’s big questions or can symbolise the end of a beautiful worldview. All of Martin’s mushroom paintings have this ambiguity due to the manner in which they are painted. The mushrooms in Psilocybin are small and plump, rendered with an expressive, restless brushstroke. Those in his recent paintings are fluorescent flecks with a fiery aura and derive their unearthly appearance not only from the fact that they are spray-painted but also from the glistening background dusted with coloured glitter [fig.]. Unlike his mushrooms, Martin’s trees seem to suggest rest and stability. He introduced the motif in the eponymous canvas Tree in 1986 [fig. ]: a vertical green beam placed on the horizon that reaches to the top of the canvas, intersected on its passage by three horizontal beams of the same colour. More recent trees however, such as the impressive Hemlock from 2010, are much less schematic, and in the enormous canvases that Martin has made specially for XXXL the background is even made up of a photograph of trees. [figs.]. But these too emphasise that the tree grows as a consequence or an inherent upwards thrust and now and then tenderly stretches sidewards to entangle itself in another tree. Martin’s trees are like humans and some of them are dedicated to particular people. For direct dedications he more frequently employs a seven-pointed star or a galaxy comprising seven dabs (or patches or objects such as old-fashioned gramophone records) connected by a network of lines. Or a row of swaying dancers. This is the last and most characteristic motif in Chris Martin’s work: undulating lines that lead your eye upwards from the canvas’s lower edge. Strange indeed, but you never see them descending. The different coloured spaces between two lines (sometimes just black and white; sometimes yellow, red and blue; sometimes other or more than three colours) create wavy stripes that evoke diverse associations: smoke plumes rising from the earth or ripples in water, lava lamps in a teenager’s bedroom, ghostly apparitions of people whose names are inscribed on the lower edge of the canvas, or bodies coiling in a sensual dance. Some paintings exude a nocturnal atmosphere with deep hues and twinkling lights. Others have blindingly bright colours and play with the idea of a sweltering sun-drenched summer’s day. Here Comes the Sun from 2004-07 produces an all-embracing synaesthetic experience: looking at the painting, you hear the famous Beatles’ song written by George Harrison (1943-2001) in 1969 that became such a big hit that NASA considered sending it with the Voyager space probes as a sample of human culture. This plan eventually came to nothing because EMI didn’t want to give up the rights to the song to any eventual extra-terrestrial life forms [fig.]. Attention! Installing Chris Martin’s works according to motif creates exciting routes that crisscross his oeuvre. But please don’t forget to pay attention to the individual paintings and enjoy their many details. Since 2004 Martin has been able to devote all his time to painting. When his mother died that year, he decided to break his practice of painting over earlier canvases in an attempt to turn them into something they are not. Failures? Successes? Since then Martin has painted just as he draws, with spontaneity and directness, and he grants each and every canvas a place in his oeuvre, even if it calls to mind a bad Chaissac (1910-1964) or a second-rate Miró (1893-1983). There are no more failures, and this creates an enormous freedom, not least of all in the choice of materials. To the aforementioned gramophone records and glitter we might add newspapers, cushions, paint-pot lids and toasted sandwiches. In and under the emblematic motifs he draws portraits; glues beads, leaves and doll’s eyes; and pastes photos from newspapers or magazines. From a distance the paintings ‘lift the top of your head off’, invite you to come closer and then reveal an entire interior universe. Will these unbridled works stand the test of time? Martin seems unconcerned with this question, indeed he sometimes hangs his paintings on the side of the building, exposed to the elements. In this way he subjects what he has made - and in which he has invested his soul - to the ravages of time, to be absorbed in the natural, undulating movement of the universe. 135 by 109 3/4 in. 342.9 by 278.8 cm. 48 by 39 in. 121.9 by 99.1 cm. 29 by 25 in. 73.7 by 63.5 cm. 36 by 26 in. 91.4 by 66 cm. 88 by 77 in. 223.5 by 195.6 cm.